For years I’ve been hearing about the Spanish Virgin Islands, as they’re called, on the eastern edge of Puerto Rico: how they’re like the U.S. and the British Virgin Islands once were before being discovered by the charter and tourist trade, with their wide-open anchorages, sleepy port towns, and nearly deserted beaches. Imagine my surprise then when the taxi driver who’d picked us up at the airport in San Juan dropped us off at the truly vast boating complex that is Puerto del Rey Marina, where we were to charter the Jeanneau Sun Odyssey 349Seven Saturdays from Sail Caribe Yacht Charters. Built in 1988 and remodeled in 2014-15, Puerto del Rey Marina is one of largest marinas in the Caribbean, boasting 700 slips with plenty of room for a megayacht or two. There is also the full complement of marine services, and the expansive concrete docks are so long and wide the preferred mode of transport is a golf cart. The surrounding hills, dotted with elegant whitewashed homes, looked downright gorgeous—everything you could hope for in a Caribbean destination. Nonetheless, chatting with Sail Caribe owner Jim Veiga after topping off at the fuel dock before we cast off the lines, I couldn’t help wondering just exactly what it was we had gotten ourselves into. Luckily, as is so often the case when chartering—and with life in general—it didn’t take long after striking out on our own to realize there was still plenty of room for all. Like the better-known U.S. Virgins and the BVIs, the Spanish Virgin Islands—which lie about 25 miles to the west of St. Thomas—are heavily influenced by the trade winds, which blow to varying degrees out of the east-northeast. 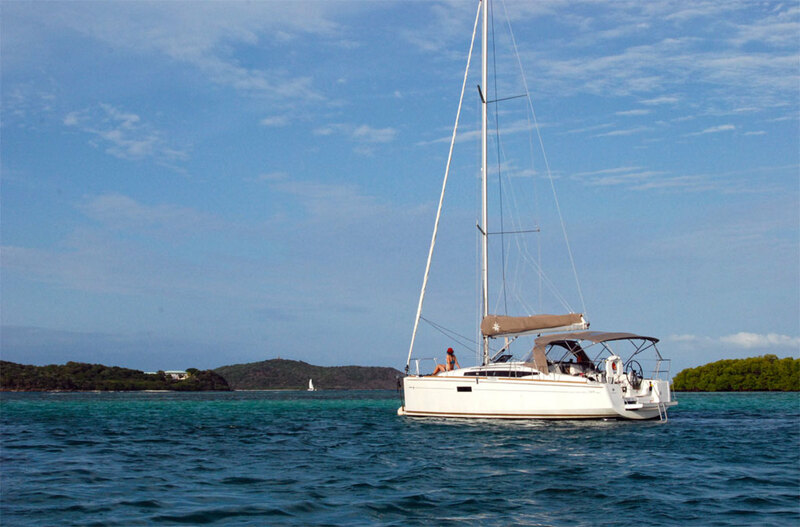 As a result, the sometimes challenging first step when setting out on a charter on these grounds is to get east, toward the island of Culebra, about 17 miles away. From there you are free to continue on along a roughly clockwise route, exploring the rest of the archipelago at your leisure, knowing that 1) you will have a nice, easy downwind sail back home and 2) that you can easily spend nearly all of your time in the lee of whatever island you happen to be exploring on any given day. 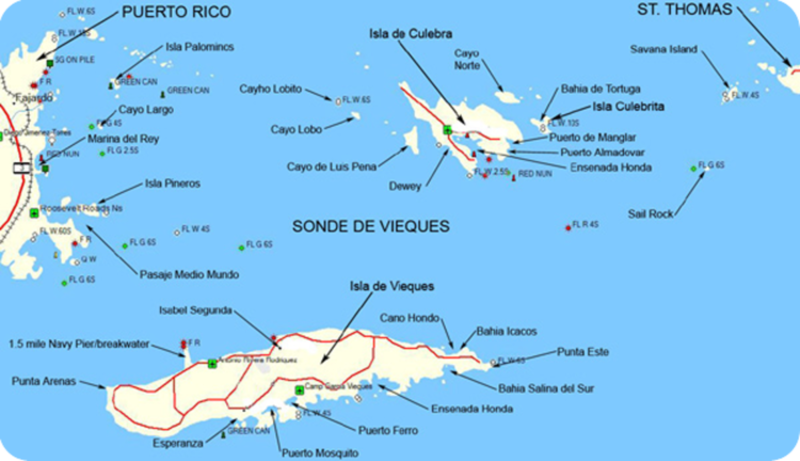 With this in mind, after giving a wide berth to the shoal just north of the marina entrance, we set course due east across the Sonda de Vieques, or Vieques Sound, toward Cayo de Luis Peña and promptly found we had the place to ourselves. Every now and then an inter-island ferry would steam by in the distance. There were also the occasional sport fishing boats and one other sailboat, which we spied returning to the same marina whence we came. But beyond that, the contrast to, say, Pillsbury Sound in the U.S. Virgins, couldn’t have been greater. Better still, the trades seemed to be taking a rest that morning, so that we had a mere 10 or so knots of breeze out of the northeast to power use through the minimal chop—perfect conditions for both getting our sea legs back and getting to know a new boat. “So far so good,” I thought to myself as my wife, Shelly, and our 12-year-old daughter, Bridget, assumed what I’ve come to think of as their “passage stations”—stretched out with their eyes closed on either side of the cockpit, occasionally expressing amazement at the fact that the Old Man never seems to grow weary of puttering around behind the helm. An hour or so later, the wind had begun to build, as did the chop, despite our having at least nominally entered into the lee of cayos Lobo and Lobito, which stretch out to the east of Luis Peña. Soon enough, though, we entered the true lee of Luis Peña itself, where our only neighbor was a small tour boat out of the nearby town of Dewey on Culebra, and we had the pick of the half-dozen or so mooring balls. Note only that, it was on Luis Peña that we had our first taste of what would come to be one of my favorite parts of cruising in the Spanish Virgins—a surrounding landscape that is either completely or almost completely devoid of any sign of human life. Over in the BVIs and on St. Thomas, in particular, the hillsides are packed with buildings, the landscape crisscrossed by roads. But in the Spanish Virgins, notwithstanding the hustle and bustle that is the nearby mainland, mile after mile of largely unspoiled shoreline is pretty much the rule. In many ways, it reminded me of sailing in Australia’s Whitsunday archipelago—another place that, while far distant, should not be missed. One can only hope the Spanish Virgins will somehow be able to preserve this relatively unspoiled aspect for years to come. Soon afterward, following lunch and a swim, we continued on to nearby Culebra, which stretches northwest to southeast, creating a vast lee against the trades. Once there we grabbed another mooring ball in the middle of Bahía Tarja, just north of the entrance to Dewey. After that, it was time to fire up the dink to pay a visit to town. Truth be told, our original plan had been to spend the night on another mooring off Punta Melones, just around the corner from Dewey’s Bahía de Sardinas. But there were—gasp!—already three other boats there, so we elected to move on. Oh, the hardship! Although, as fate would have it, we ended having our own particular spot completely to ourselves for the duration. Dewey itself proved to be more of the same—uncrowded, quiet and utterly charming—especially, I suspect, because it was midweek when there are few, if any, Puerto Rican tourists from San Juan paying a visit to its many restaurants and shops. A canal connecting Bahía de Sardinas to Ensenada Honda, a magnificent anchorage providing protection against winds from every point of the compass, bisects the small community and makes for a fun trip. Our original goal had been to go to an eatery called The Dinghy Dock, a satisfyingly grungy spot favored by many sailors. However, upon tying up our dinghy to said dock, we were informed that the kitchen was closed and we’d have to wait for the better part of a half-hour in order to be served—more hardship!—so we set out in search of more immediate sustenance, eventually landing at Mamacitas: a slightly more upscale place that offered such local delicacies as stuffed cassava mofongo, fried plantains, grilled lobster tail and fresh mahi-mahi. As is the case with The Dinghy Dock, the dining area at Mamacitas is right on the dock. In fact, surrounded as it is by mangroves, we had dinghied right past it on our way through the canal to Ensenada Honda. I also got my first taste of the locally brewed Medalla Light. Not a bad way to start our week. After that, it was more of the same under sparkling skies and on near-empty seas, every day a different beach, maybe two: not a half-bad way of spending a vacation. The first full day of our charter we sailed northwest to the beach in the lee of Culebra’s Punta Tamarindo Grande—gazing upon the steep, largely wild landscape along the way. Once there Shelly and Bridget went for a short hike, while I relaxed on the deserted, immaculately white beach and kept an eye on the dinghy. In order to protect the sea turtle nests that dot the area in season, you are required to anchor out, as opposed to dragging up your dink onto the beach. Given this arrangement, I was concerned that with the slight swell coming in, the tiny anchor would not keep the boat off the coral shore as the tide went out. Later, after lunch in the cockpit, we sailed back down the western shore of the island—alternately sailing through puffs and lulls as the trades did their best to sneak their way between the nearby hills to windward—to a place called Ensenada Dakity, one of the most spectacular and nerve-wracking anchorages I’ve ever seen. The approach is from deep water directly through a narrow, unmarked break in the coral reef guarding the southern tip of the island. With the sun starting to go down in the west, obscuring our ability to see clearly into the water, I would never have attempted it without a chartplotter. After that, there was the left-hand turn around the mangroves that were clearly marked on said chartplotter, but no longer in actual existence. More tense moments until we opened up the anchorage itself, which we had to share with all of two other boats. Once there, though, we were treated to mill-pond smooth water, even as we felt the cool trades coming in off the open Caribbean and watched the waves crashing against the same nearby reef that had scared the bejesus out of me only a short while before. Later, we saw a couple of manatees—clearly among the coolest creatures on this planet with their chill perspective. Suffice it to say, it was one of those spots where it was almost with a sense of disappointment that we cast off our mooring the following morning. Alas, as we threaded our way back out onto open water and out from behind the lee of Culebra, we discovered the trades were hard at it again—so much so that we elected not to make the trip to the fabled beach on Isla Culebrita, which is open to the northwest and can get pretty rolly. Tougher still, while I had hoped the downwind run to Vieques would be fairly stress-free, the wind quickly built into the mid-20s, meaning we had to remain on our toes. We also soon found ourselves having to contend with a pair of distinctly different waves sets coming from the north and southeast, which made for a much bumpier ride than anticipated. The seas off the starkly rocky eastern point of the island, in particular, elicited disapproving looks from the crew—passage stations everyone! Coming around to the south shore of Vieques, though, everything quickly settled back down again as we sailed on a now leisurely broad reach to our intended anchorage, Bahía Chiva, just east of the island’s midpoint. Having once served as a bombing practice area for the U.S. Navy, the entire eastern half of the island is still littered with a live ordinance, which is a bummer for Puerto Rico, but great for nature lovers, as the entire area is essentially free of any further human interference. 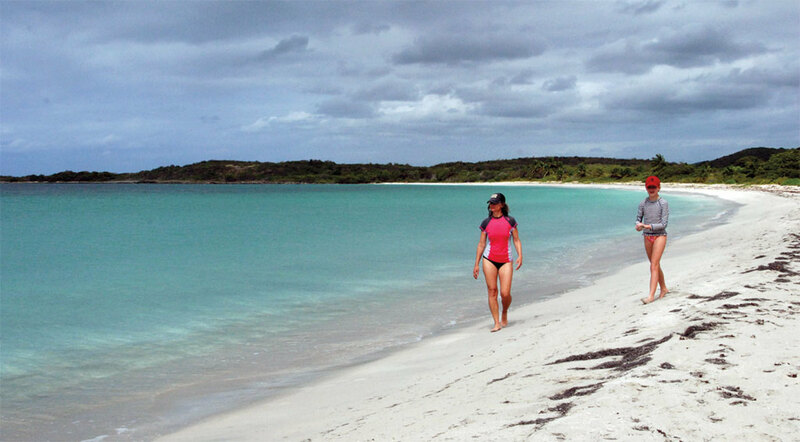 Indeed, as untrammeled as Culebra may have appeared, Vieques is truly empty, in a way that is nothing less than awe-inspiring when viewed from offshore. That said, even in those areas that have been cleared for anchoring you have to be a bit careful. “Hey, Bridget. What does that buoy say?” I called out as we were getting ready drop the hook in the lee of the small island bisecting Bahía Chiva. “Good idea,” said Shelly, who’d already been suggesting as much for the past few minutes. Fortunately, it seems the local flora and fauna doesn’t know how to read, because when we snorkeled over there the next morning, we found the best coral I’ve ever seen so close in to shore in all my life. (Yes, snorkeling is permitted in the area. You just can’t set foot on the island.) We also had the enormous white-sand beach almost entirely to ourselves, to a degree that would have been unimaginable one, say, St. John. And so it went: continuing along the southern shore of Vieques, stopping in one night at the dusty little port town of Esperanza for dinner and some provisioning, and then anchoring the last night of our charter off Punta Arenas, at the very western tip of the island. Once again we found ourselves sharing an enormous, pristine anchorage with all of three other boats and having absolutely nothing to see ashore save untrammeled sand, palm trees and some rugged green hills in the distance. Away to the northwest, I could just make out the lights of Puerto Rico, but what did it matter? In that particular moment, we had a great boat, a great anchorage and all the peace and quiet we could ever want. If we would soon have to re-enter the hustle and bustle of modern life, so be it. In that moment of serenity, I had every confidence that tomorrow would take care of itself. What more can you ask of a charter than that?